Is your document management system a plug-and-play, off-the-shelf "solution" that leaves you on your own when it comes to handling your workflow? We hate to break it to you, but what you're dealing with is not a document management system. You may be sharing documents and pulling files through your system, but you aren't truly managing your business process workflow. With over 25 years of industry experience, DocuVantage team members guarantee the multi-faceted consulting services for all of your business and technical needs. EXPLORATION: First, we take a deep dive into your organization, working to understand your challenges and goals as well as policies and procedures. CONSULTATION: Then, we consult your vital team members, interviewing them together and individually. This process is done with senior management out of the room to promote and engage a successful forum of open discussion. IMPLEMENTATION: Finally, we help you analyze, design and implement your perfect workflow automation and document management software that's both adaptable and accessible for everyone who uses it. Stop consuming yourself with the frustrations of managing the system. 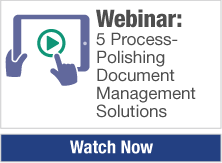 Start capitalizing on the advantages of document management. Ready to start the conversation with DocuVantage and get on board with a document management system that meets your needs and not someone else's? Click below to get serious about driving your organization's automated workflow and operational efficiency.